The intersection of Maria-Theresien-Strasse and Franz-Josefs-Quai in Vienna is a good example of where the streets prioritise movement of automobiles over pedestrians and bikes. Vienna’s working hard on making the city better for biking and walking, but it’s a difficult job. There are many places, like the intersection above, where the streets and traffic signals have been designed to move traffic, bikes and pedestrians are accommodated, but not a priority. This is a situation that needs to change if the city is to be successful at making transport more sustainable and the city more liveable. Many streets and intersections in Vienna need to be rebuilt to improve conditions for pedestrians and bikes – but this often comes at the expense of automobile traffic. That’s too bad, but the priority today must be given to pedestrians and bikes if we are to create more sustainable cities. And, the evidence from many cities is that reducing automobile traffic doesn’t hurt the economy, in fact building better bike lanes and sidewalks can actually increase business. Making these kinds of improvements requires two things: desire and design. City transport departments must want to go from moving cars to moving people and they need good designers who understand the fine points of traffic engineering. The intersection shown above is a good example: it’s a very complicated intersection: two very busy one-way streets with a two-way tram line turning across the intersection. The traffic engineers have done a good job for cars and trams, but it’s not so good for bikes and pedestrians who have to cross between several islands with different traffic signals. 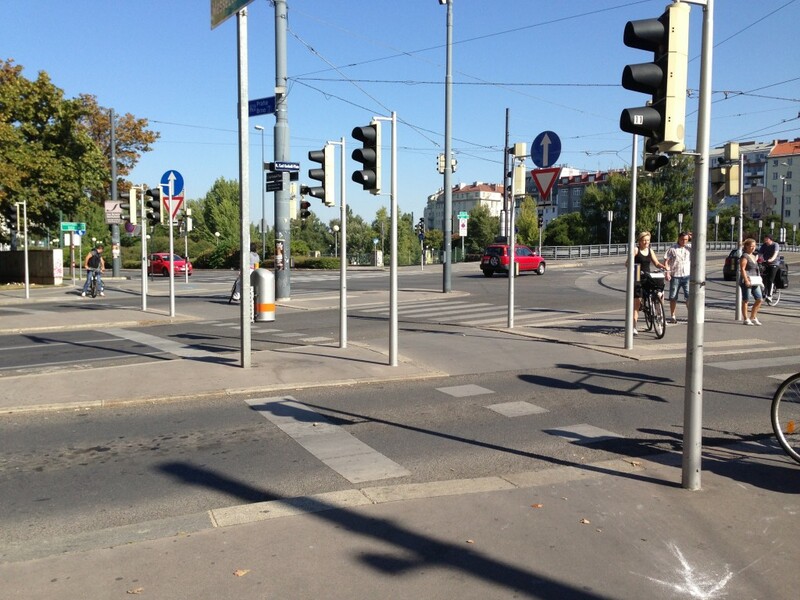 Also important to note is that the intersection is on path between the Ringstrasse bike lane and the Donau Canal bike lane, so its used by many bikers. It’s a complex problem that can’t be easily solved. But improving these types of intersections to be more bike-friendly will be critical if Vienna is to meet its goal of increasing bike use.